Three weeks before the start of its college football season, the University of Maryland has put its head coach on administrative leave while it investigates accusations of abuse and intimidation. A player died on his watch. After DJ Durkin won his first game as head coach of the university’s football team — a return to greatness seemed possible for the long-struggling program. But less than two years later, one player is dead after collapsing during practice. Durkin is suspended amid explosive allegations of player mistreatment. Once again, the school sports program is struggling to define the difference between high expectations and outright abuse. 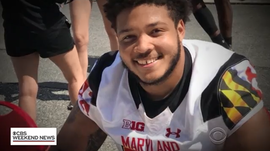 Freshman Jordan McNair was hospitalized May 29 and died June 23 after running 110-yard windsprints at a team workout. While no official cause of death has been released, a lawyer for McNair’s family, Billy Murphy Jr., says coaches showed a disregard for the student’s health. “It’s not reasonable that a 19-year-old should pass away,” Durkin said at a press conference, holding back tears. Murphy said Sunday he’s seen the preliminary death certificate and has concluded, “This is an obvious heatstroke case,” according to The Associated Press. Head coach DJ Durkin seen Oct. 8, 2016. Durkin denied the allegations in a letter to parents, saying safety is a daily priority.